Portfolio planning is a very useful tool. It is the method that helps the company executives to assess their firms’ prospects for a winning share within each of its industries. It also offers suggestions about what to do within each industry, and lets the managers have ideas on how to allocate resources across industries. Portfolio planning determines the company’s position within the industry. The management in charge of large firms that are involved in many different businesses must find out how to manage such portfolios. For example, General Electric (GE) has a very wide variety portfolio of industries, including financial services, insurance, electricity generation, light bulbs, television, theme parks, robotics, medical equipment, railroad locomotives, and aircraft jet engines. GE executives, therefore, must make a decision about which units to grow, the ones to shrink, and the ones that needs to be abandoned. 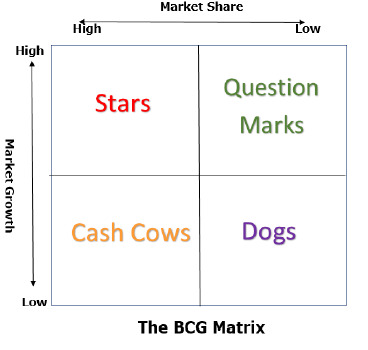 The Boston Consulting Group (BCG) matrix is the most popular approach to portfolio planning. The matrix categorizes a firm’s businesses as high or low along two dimensions: the market share and the growth rate of its industry. The high market share units that have a slow-growth industry are called cash cows. As their industries have quite bleak prospects, profits generated from cash cows should not be invested back into cash cows but rather they should be diverted to more promising businesses. Low market share units that fall within slow-growing industries are called dogs. These units are good for divestments. High market share units that fall within fast-growing industries are known as stars. These units have very bright prospects and thus are considered good candidates for growth. Low market share units that fall within fast-growing industries are called question marks. These units can either be converted into stars or divested. The BCG matrix is not the only one portfolio planning technique. GE has developed the attractiveness-strength matrix to examine its portfolio of diverse activities. This planning technique involves rating each of the firm’s businesses in regard to attractiveness and the firm’s strength within the industry. Each dimension is usually divided into three categories that result in nine boxes. Each of these boxes have a given set of recommendations related with it. Portfolio planning is a useful tool, but has important limitations. Portfolio planning usually oversimplifies the practical reality of competition by focusing only on a pair of dimensions while analyzing the company’s operations within an industry. There are importance of many dimensions to consider while making strategic decisions, hence two are not enough. Portfolio planning is a useful tool but it can lead to motivational problems among employees. For example, if workers readily know that their firm is classified as a dog, then they may give up pushing ahead and lose all hope for the future. Portfolio planning does not identify any new scope. This tool only deals with existing businesses.